My husband (whose birthday is today!) and I have worked out a deal around here- I do the cooking and he does the clean up. This may sound like a fair trade, but sometimes the kitchen looks less gourmet preparations and more tornado aftermath lol. I love intricate dishes with lots of components but that’s easy for me to say because I’m not the one doing all the dishes so it’s nice when I come up with a meal that’s not only delicious but is cooked and served all in one easy to clean pot! 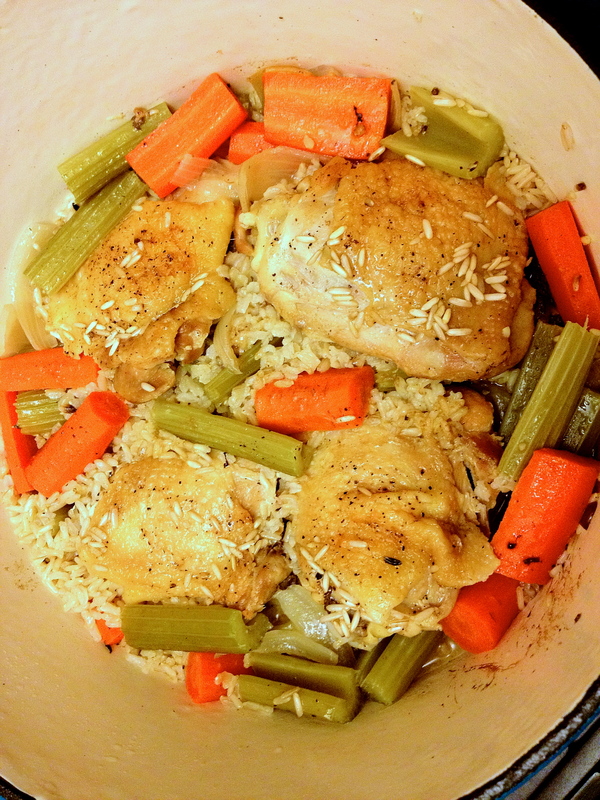 Seared chicken thighs with lots of veggies add tons of flavor to the brown rice that’s cooked right in the same pot with some stock… this is perfect for the fall. It combines the deliciousness of a warm and comforting meal with the ease of only having to clean one pot at the end of the night. I’ve also tried this by adding the rice, turning off the heat, leaving it covered for a few hours and returning home to a perfectly done dish that’s ready to go! Make this meal as treat this weekend while watching football or easily add it to your week night repertoire! Start off by heating 1 tbsp extra virgin olive oil over medium-high heat in a heavy bottom pot or dutch oven. (I use a Martha Stewart one from this collection and I have to say, dutch oven are SO worth the investment. My mom bought me the 8 qt one for Christmas one year and then got me the 3 qt one to match on one of our shopping excursions and they are so versatile that we use them for everything!). 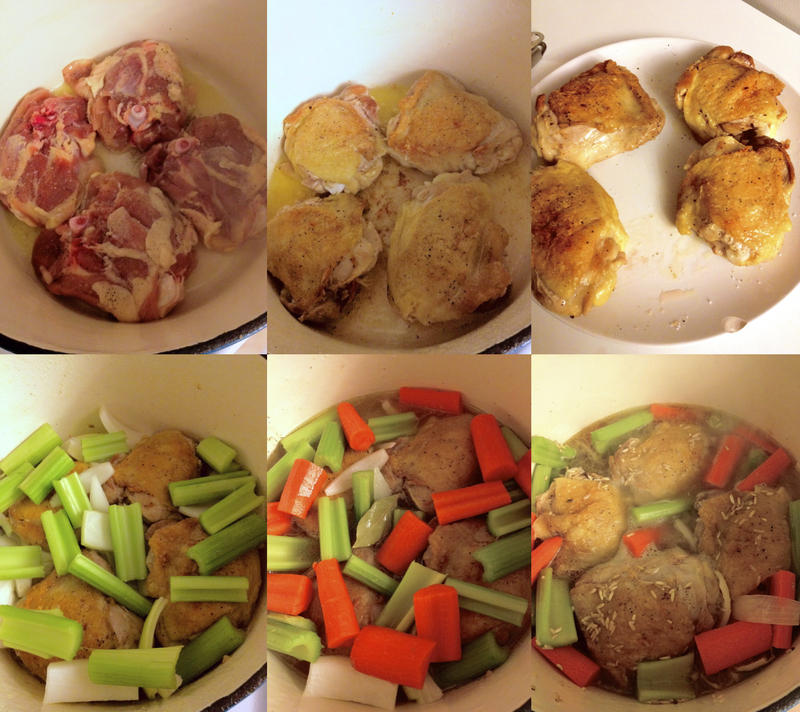 Take four bone-in skin-on chicken thighs (6-8 ounces each) and pat them dry with a paper towel. Season them on both sides with coarse kosher salt and freshly ground black pepper. Place them skin side down and cook until golden brown on both sides, about 12 minutes total. Remove the chicken carefully and set it aside while you pour off all but 1 tbsp of the chicken fat (you can omit this step, I just do it to make the dish much lighter since I’m leaving the skin on the chicken). Put the chicken back in the pot and add in 1 large white onion that’s been cut into 8 quarters and 2 celery stalks that have been cut into 1 1/2″ pieces. Stir well, reduce the heat to low, cover and cook for 20 minutes. Uncover and add 2 medium carrots that have been peeled and cut into 1 1/2″ pieces, 1 dried bay leaf and 1 3/4 cup vegetable or chicken stock (you can make this even lighter by using water, but you’ll get less flavor). Stir in 1 cup brown rice, season with salt and pepper, bring to a boil then reduce the heat to low again. Cover and cook until the rice absorbs almost all of the liquid, 40-45 minutes. Let stand, covered, for about 10 minutes before serving and remove the bay leaf. Thanks! Its simplicity is definitely the best part!